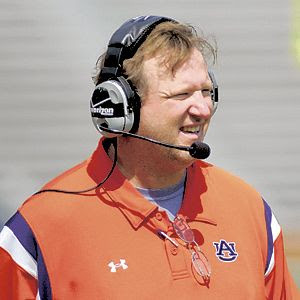 Auburn University fired offensive coordinator and spread offense guru Tony Franklin on Wednesday just ten months into his tenure. Tommy Tuberville, the head coach at Auburn said he remained committed to the spread offense, but a change in play calling and style was required and he was going with his 'gut felling' on the decision. "It hurts. It hurts bad," Tuberville said on Wednesday. "It's a difficult situation. It's a difficult thing to do in the middle of the season. My responsibility is to this football team and it always will be. Tony's a good person. When it all comes down to it, it's about production. I didn't think over the last few weeks we were making any progress." Tuberville hired Franklin from Troy last December after firing Al Borges. Franklin led the offense in the Chick-fil-A Bowl — a victory over Clemson that created a lot of excitement over the new offense at Auburn. Auburn plays Arkansas this Saturday in an SEC battle. After the first 5 weeks of the 2008 college football season, it's obvious that Missouri's spread offense lead by Chase Daniel is the most exciting and diverse in college football. Through four games, Daniel has completed 101-of-133 passes for 1,412 yards, 12 touchdowns and one interception. 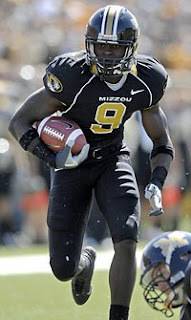 Not to mention one of the most exciting skill players in the country, Mr. Everything Jeremy Maclin. To read more about Missouri's recent win over Nebraska, Click Here.